A statue of angel sits atop the Notre-Dame-de-Bon-Secours Chapel along Rue Saint-Paul in Old Montreal in Quebec, Canada. From miles around, people can see the statue of an angel which adorns the top of the Notre-Dame-de-Bon-Secours Chapel along Rue-Saint Paul in Old Montreal, Quebec. This is one of the oldest churches in Montreal and the angel stands high watching over the harbour of Old Port. 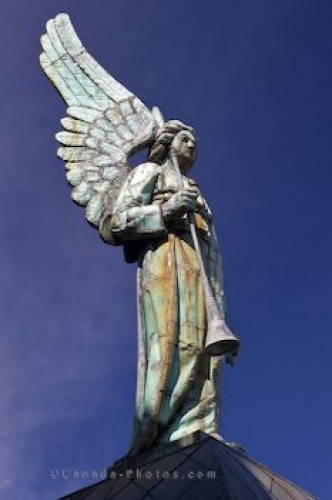 Known as "Our Lady of the Harbour" statue, the angel was made by famous poet-songwriter, Leonard Cohen. First built in 1655 as a wooden chapel, it was later rebuilt in stone in the late 1670's. In 1754, a fire destroyed the chapel and a new chapel was built, once again out of stone which today shows off it history and heritage and is a famous landmark site in Old Montreal. Picture of a statue of an angel on Notre Dame de Bon Secours Chapel in Old Montreal, Quebec. ... m., from November to the middle of January from 11:00 a.m. to 3:30 p.m. and from March through April from 11:00 a.m. to 5:00 p.m. The chapel is closed on Mondays and from the middle of January until the end of February. Angel atop the Notre-Dame-de-Bon-Secours Chapel along Rue Saint-Paul in Old Montreal, Montreal city, Quebec, Canada.